Boon Sheridan loves solving problems and sharing stories. 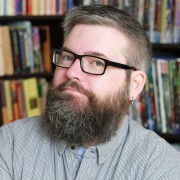 He brings over 15 years of design and strategy experience to life in words, pictures, personas, maps, flows, workshops, and the occasional voice-over. As a card-carrying geek, Boon hates duplicating efforts. Over the years he’s taken apart the way he and his teams work, found common goals and mapped where overlaps occurred. Now he adds a pinch of audience needs and content models into persona dimensions, sprinkles site goals and structure into editorial plans and sleeps much better at night.